Internet security is something we all should take seriously, there are plenty of headlines reminding us of the various nefarious ways criminals try to gain access to our information and systems. Luckily there are plenty of companies out there offering packages to help take the strain of looking after our precious data. 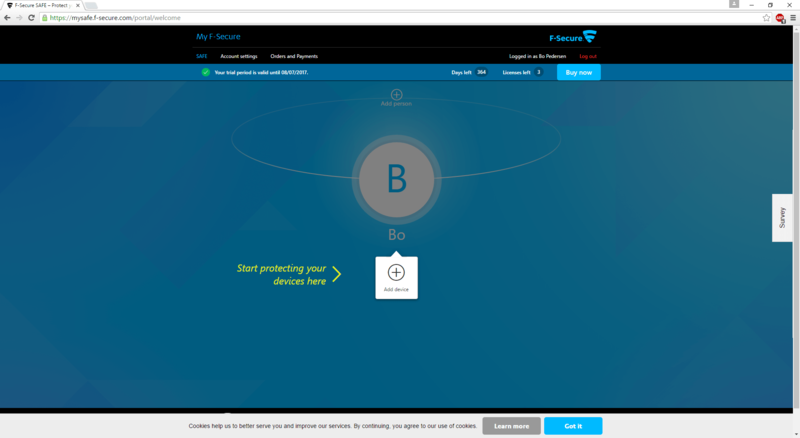 F-Secure SAFE is a multi-device security package available either directly from F-Secure’s website or various retailers. The package I am reviewing is the 1 year 3 device license. 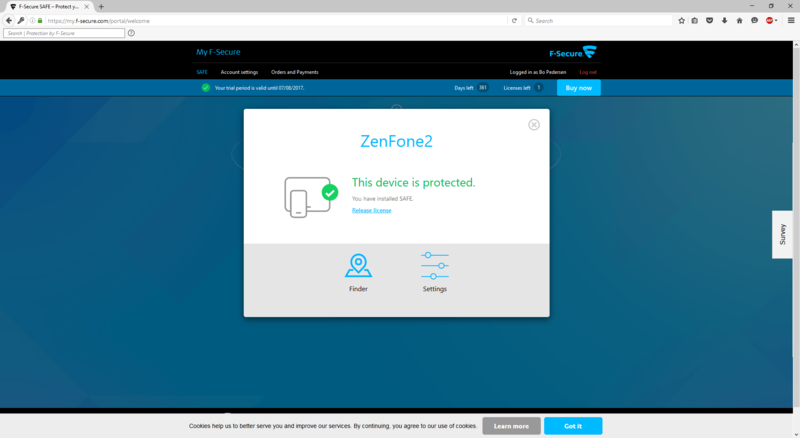 The SAFE product covers Virus Protection, Browsing and Banking Protection, Network Protection along with a Device Finder and Remote Controller. Available on any three devices, even if you don’t own them, meaning this is quite a good product for protecting several systems in a family. Let’s see how this all works. Browsing to www.f-secure.com you are met with the main page boldly giving you two options, For Home or For Business as they have separate products for use in a corporate environment. Selecting For Home, there are further options including a Free Online Scanner, but I am after the main product on the page F-Secure SAFE. There is the option here for a Free Trial, so you can try it first. Once you create an account, confirm your email address and when received, enter your License key you are presented with a very clean and uncluttered overview page. From here you can start to add the devices you wish to protect. I initially selected my main Windows 10 machine which shows as Current Device in the step by step menu after clicking on Add Device. The installation process is pretty straight forward, with each step explained well, from selecting the type of device through running a small download which launches the main installation. 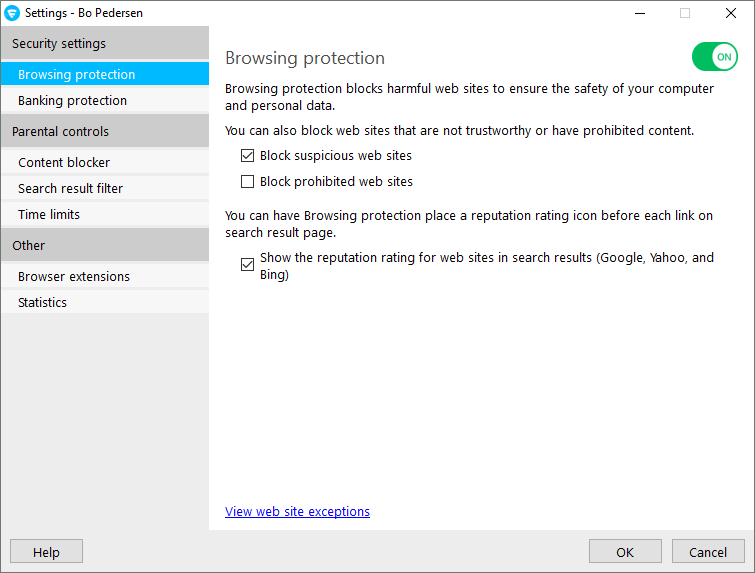 My configuration, prior to installing F-Secure on my Windows 10 machine, consisted of Microsoft’s own Windows Defender, backed by a full version of Malwarebytes. F-Secure automatically disabled Windows Defender but has left Malwarebytes running. Following on-screen prompts my default Firefox was set up with Browsing and the optional Search protection which adds in a toolbar. It also triggered setups in the background for my Chrome and Internet Explorer browsers asking for confirmations when these were launched. The second device I wanted to add was my ASUS Zenfone 2, an Android phone running on an Intel Atom processor. I chose to send an SMS to my phone to start the installation, curiously the SMS box has a default entry of +358 which caused some confusion trying to get an SMS by entering my phone number after it. You have to use your international dialing code and number to receive the SMS, in my case for the UK +44 you must also remember to drop the leading 0 from the rest of your phone number. Another thing to remember is to use WIFI where possible as installing applications like this can eat into smaller data packages. The final device license will be applied to my sons’ ASUS Laptop, which is mainly used for gaming, general browsing, and university work. This will be done using the Add Person feature seen near the top of the main screen, here you can send an email to the additional user who can then use the link to install F-Secure SAFE. This is a very easy and straight forward process. 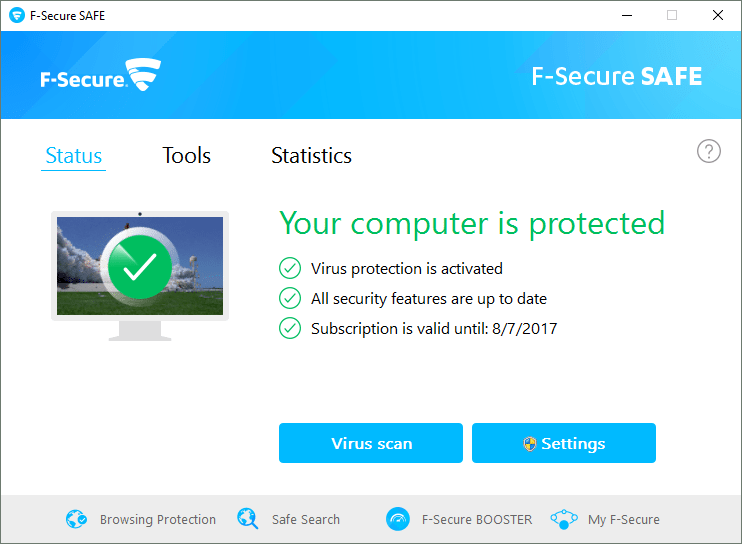 F-Secure SAFE comes with quite a few features, Virus Protection, Deep Guard which monitors and helps prevent installation of applications which may be unsafe, Network Protection features that run in conjunction with Windows Firewall and Spam Filtering for use with an email application such as Outlook or Thunderbird This feature does not affect email accessed through the web browser as that will be protected by the Browsing Protector. The Browsing Protector comes with its own set of features, which extra configurations for Banking protection and Parental Controls. It’s nice to see these included in an antivirus package, as they are often sold as a separate product. 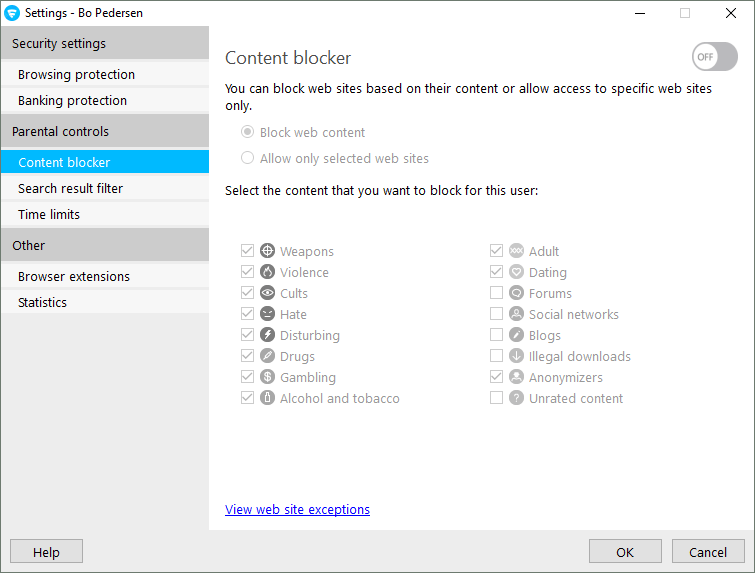 The Parental controls offer features for controlling browsing access through strict website access controls or content filters, search result filters and time limits. 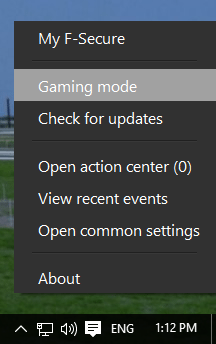 The system tray icon for F-Secure SAFE has some helpful shortcuts including a Gaming mode, this is especially useful for preventing popups and other system hogging processes from running during games, select it to simply switch on Gaming mode. I tried gaming both with it on and off but have yet to see any system slowdown or event interruptions. 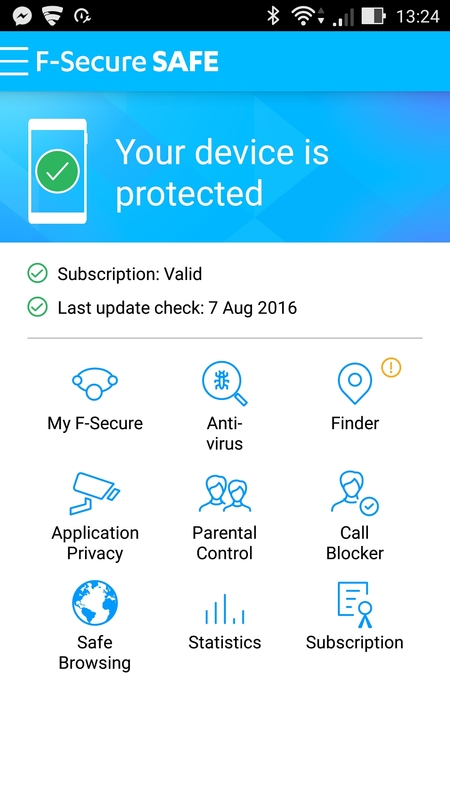 F-Secure on an Android phone is a very comprehensive product, offering many features that are not normally included in a basic antivirus solution. 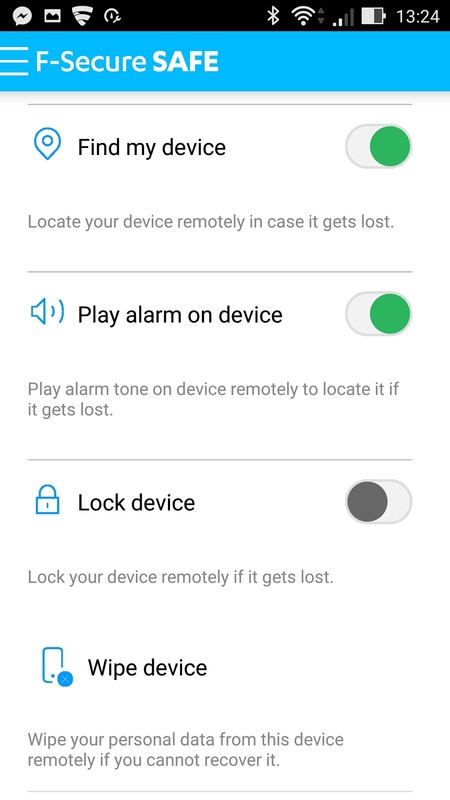 Things that stand out on the following screenshots are the Finder, this is where you set up the processes you want to enable if the phone or is lost or stolen, it gives you a location service along with a device lock and a device wipe feature, which can be accessed remotely by logging onto your F-Secure account on a web browser. Furthermore, there is a trusted number that can be set up to receive an SMS if the SIM card is removed or changed in the device. Application Privacy scans your device’s installed apps and gives them a privacy risk rating consisting of Many privacy issues, Some privacy issues, and Few privacy issues. Parental Control is probably one of the best features for mobile devices, here you can set time limits, along with browsing and application restrictions; very useful indeed for bringing balance to device usage in the family. Call Blocker is an unexpected feature, I would normally expect this as a separate product, here you can select numbers from your address book or call history and they will be quietly declined if they call again. Logging into the website gives you control over some aspects of your devices features. This is especially useful for mobile devices giving you the remote control necessary to find, lock or delete remotely. The Settings section gives you the opportunity to rename devices within F-Secure. 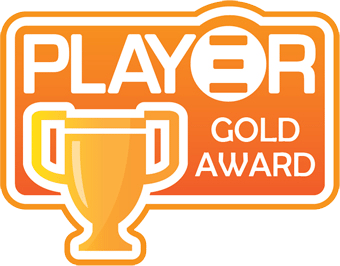 Pricing varies depending on the number of devices and years chosen, it does help to shop around too, I found the 1 year 3 device license available for as little as £44 from an online store, a saving of £15.99 on the F-Secure website price. I think the pricing is fair but do remember this would be a recurring annual expense. 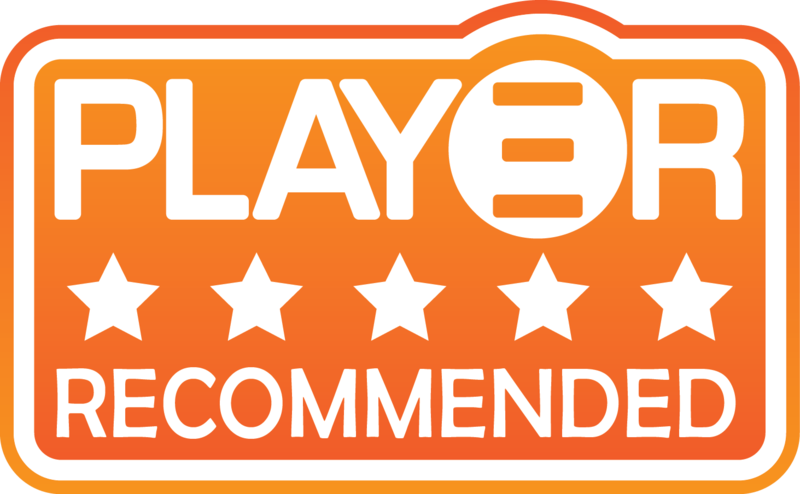 A big thank you to F-Secure for providing this review license. – Comprehensive product covering the majority of security concerns. – Great product for covering devices in a family. – Device finder and remote control is a welcome product for phones and tablets. – Lack of definitive hints made SMS configuration a little confusing. There´s a thousand reasons i could give you as to why i should win but the fact is i don´t deserve it more than any other person. I´m a gamer, nerd and a dad, protecting my data is important to me, especially all my family fotos/videos…. and that is why i would like to win. Well I want to try New Anti Virus and see it myself ! I’m actually shopping around for security software right now. With all the gaming, work, and surfing we do at home, we NEED a good, reliable software to protect our info. Safe is very important. Thx 4 the chance to win F-Secure Package. You should always be safe and secure using F-Secure Safe st great review thank you for another great giveaway woot Mod On!!! Safe is very important. Thanks for the chance to win F-Secure Package. I’m using virusbuster, mcafee, and symantec on different PCs. But sometimes I’m confused because one of them gives an alert on a software, while others don’t. I am a F-secure beta user since 2010. I love F-secure because it’s really great. My PC is still infected by viruses & malware problems. 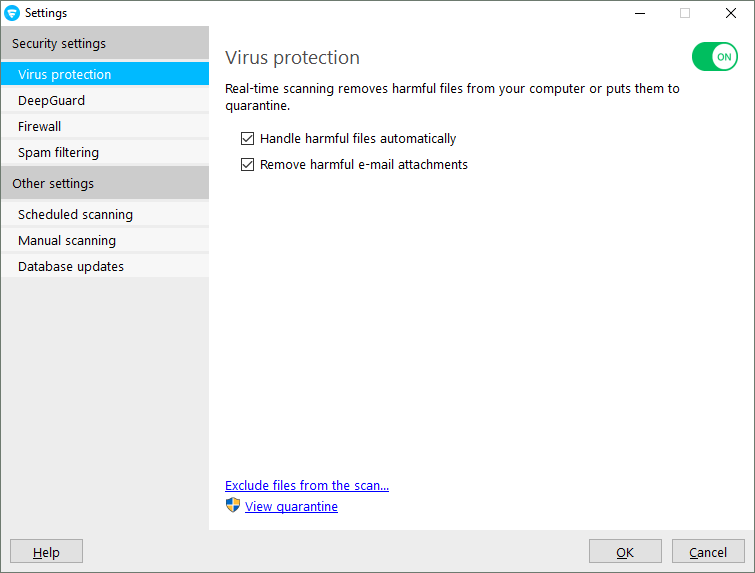 No anti-virus softwares are so effective. I think F-Secure SAFE Internet Security will be the right choice my PC.